We’re Seeing Lots of Fake Chips! TLDR: If it seems too good to be true, it probably is too good to be true. If the seller is in China and the chips cost less than $3 each, they’re probably fake. Update March 2014: This is now totally out of control. 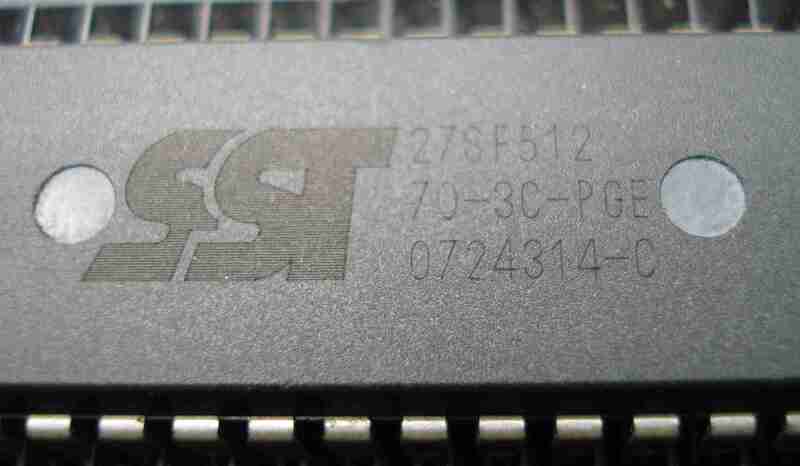 Less than 10% of the results searching eBay for “SST27SF512” were genuine chips. They’re now coming in all sorts of shapes, sizes, markings. 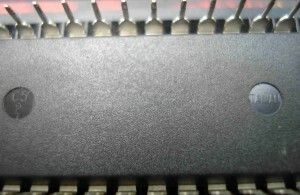 The majority of these chips are ONE TIME PROGRAMMABLE chips that have been re-marked to look like the erasable and re-usable SST chips – this means you can program them, ONCE. After that, the chips will never erase or program again. Real SST27SF512 chips can be erased and re-used hundreds if not thousands of times. 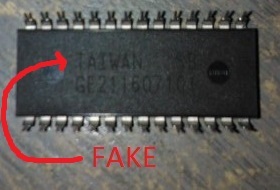 Increasingly often, we’ve been seeing problems programming chips with the BURN1/BURN2/APU1 because of COUNTERFEIT CHIPS!!! The 27SF512 chips are no longer being made and have not been in production for quite some time. (~Aug2009) I guess we shouldn’t be surprised that counterfeits of these popular chips are now common because Moates purchased the entire final production run of these chips, leaving nothing but counterfeits for other vendors to sell. 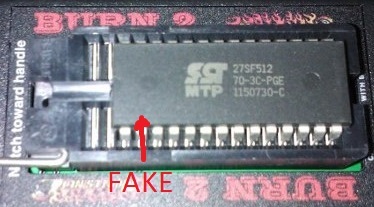 Bottom line: If the SST27SF512 chips you purchased did not come from Moates.net, Xenocron.com or one of our other re-sellers, they are probably fake because the legitimate supply of new chips from SST was sold years ago. 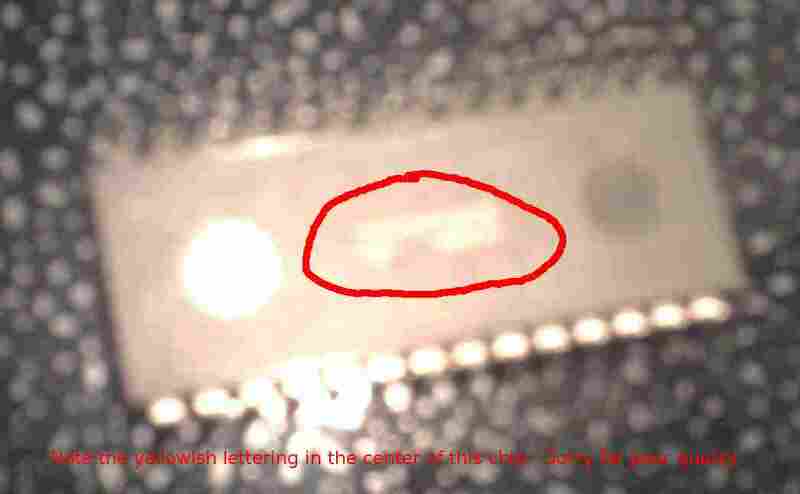 Most use a white silkscreen print on the top of the chip NOT the laser-etched found on the real deal chips. Most have printing on the bottom of the chip instead of ‘TAIWAN’ embossed in a circle. 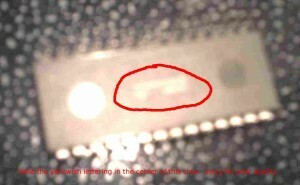 As we receive more pictures from our users of fake chips, we will post them here. Note the size and placement of the round “dimples” on this fake chip. Note the whitish silkscreened letters instead of the laser-etched letters. 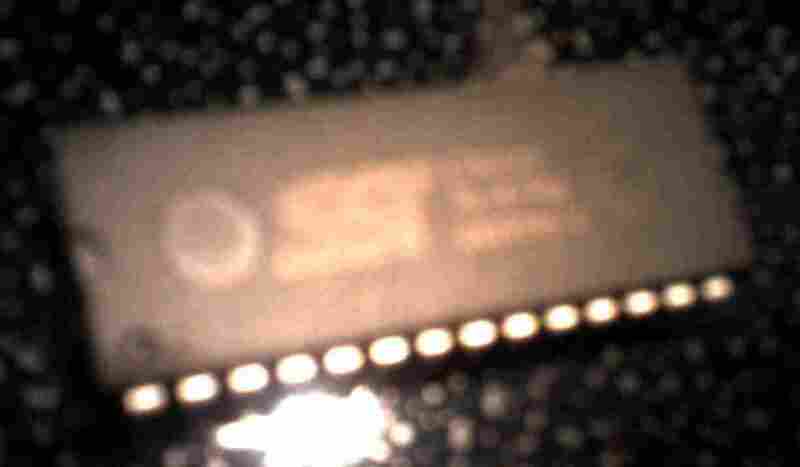 This is not a real 27SF512 chip. Note the size of the “dimples” on the bottom of this fake chip. 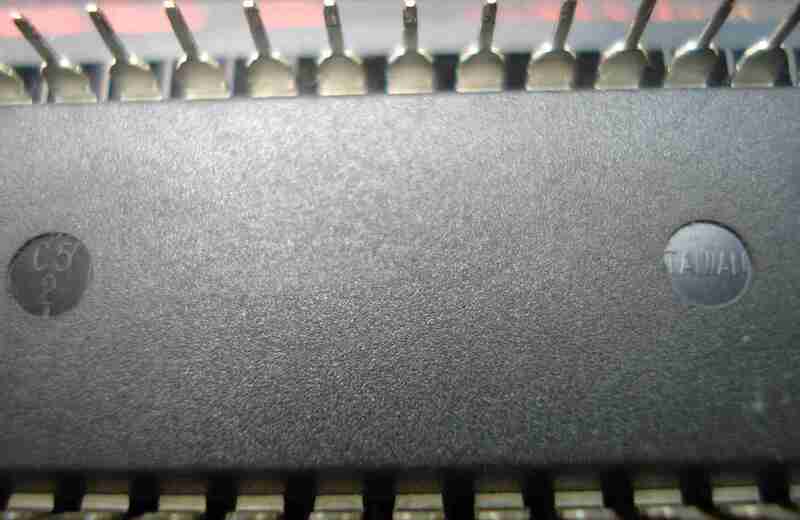 Note the writing in the center of the chip. Note the absence of “TAIWAN” in one dimple and the chip ID in the other. 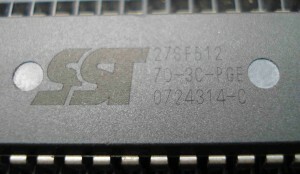 This is not a real SST27SF512 chip.